A British woman who faced prison in Dubai over a jibe she posted on Facebook has said she and her daughter plan to return to the country. Laleh Shahravesh, 55, was arrested at a Dubai airport after flying there to attend her ex-husband's funeral. She had faced up to two years in jail for calling his new wife a "horse" but her case was settled with a fine. She told the BBC it was important for her daughter to revisit her father's grave without being "clouded by fear". 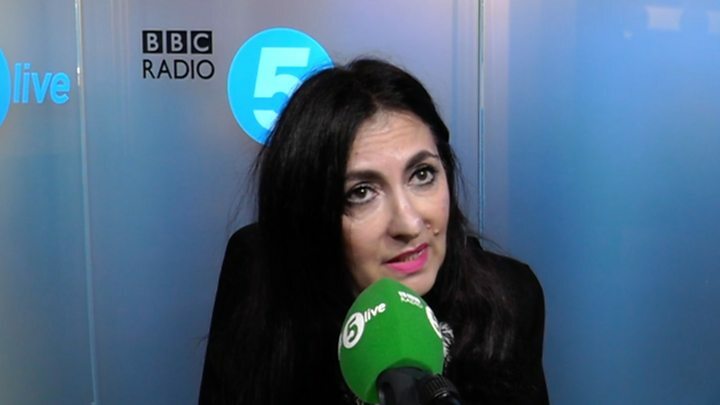 In an interview with BBC Radio 5 Live's Emma Barnett, Ms Shahravesh said she had travelled to Dubai to "pay respect" to her ex-husband, following his death from a heart attack, with her 14-year-old daughter Paris. "It was meant to be something peaceful especially for Paris, it was very, very important for her grieving process," she said. "Even though we did go to the cemetery it was clouded by fear, by sadness, by tears." She added that although the 33 days she spent in Dubai before returning to the UK were "terrifying" and "traumatic", "we went there for a reason and I feel that we were robbed". "We've talked about it and we will probably go back because I have not been banned from returning," she said. The mother-of-one from Richmond in south-west London had faced prosecution over two Facebook comments she posted on pictures of her husband remarrying in 2016. She had been married to Pedro Correia Dos Santos for 18 years. Writing in Farsi Ms Shahravesh posted: "I hope you go under the ground you idiot. Damn you. You left me for this horse." The campaign group representing Ms Shahravesh, Detained in Dubai, said her ex-husband's new wife, who lives in the country, had reported the comments. At the time of her arrest, Ms Shahravesh was with her daughter, who later had to fly home on her own. However Ms Shahravesh was able to return to the UK last week, after being given a fine of AED3,000 (£625). Ms Shahravesh credited Detained in Dubai for helping to secure her release by bringing international media attention to her case. However, she said the British embassy "did absolutely nothing to help my situation", apart from providing details of lawyers, a photocopy of her passport and advising her to go to the police station to make a statement, where she says she was held for 12 hours. "I wish to this day that I had not taken their advice to go to that police station that day," she added. A Foreign and Commonwealth Office spokesperson said: "We are pleased that Laleh has been able to return to the UK and reunite with her family. "Our staff offered advice and support to her and her family while she was in the UAE, including on local lawyers and processes, and spoke to the Emirati authorities about her case on a number of occasions."